I kept to my word. In my last post, I discussed food, our fascination with it, and giving back to those who aren’t fortunate to experience what we all have. So, I’m here to report that I actually did something about it. I also talked about donating to a cause greater than myself. Well, I’m here to report that I’ve set up monthly donations to the Bay Area Rescue Mission. Just $2.05 supplies Christmas Dinner to one person, and they expect to provide more than 144,000 meals to homeless and needy people in the Bay Area this time of year. I did it, now you can do it to! 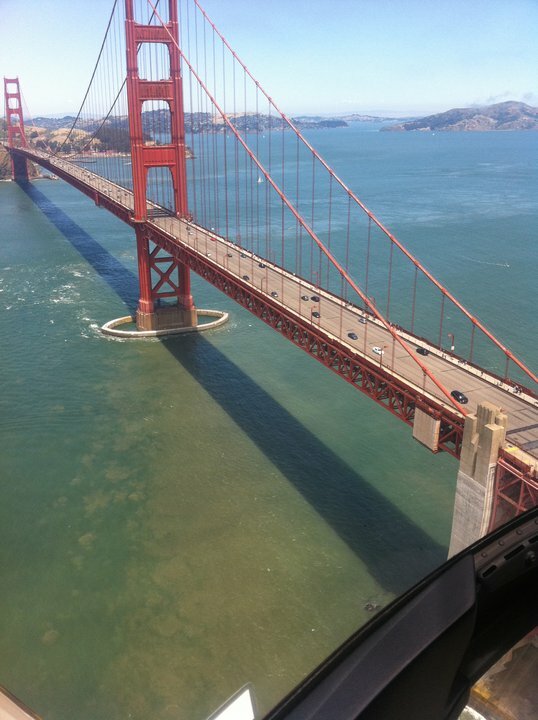 I could never recommend a more spectacular way to see San Francisco than by helicopter. Upon lift off from Sausalito, you’ll soar through the skies, travel over Mt. Tam and over the Golden Gate bridge (and under if you’re lucky, when Karl The Fog plays hookey for the day). The views are absolutely breathtaking as you fly along the Embarcadero and around all the neighborhoods you have come to know and love: Downtown to North Beach to Pacific Heights to Telegraph Hill to The Mission to Noe Valley and back! We even flew to China Basin, over AT&T Park, out to Treasure Island and Alcatraz, and back to Sausalito. In 25 minutes of flight time, I truly felt that I was able to see my city from the most amazing vantage point — high up in the skies. The thing that made this ride 100x better was that I was able to claim the co-pilot’s seat and every time I looked down, I could see the view below my feet! If you are tired of the same ‘ole hiking trails, biking the Embarcadero, or lounging in the park (and have $200 to spare), then take a ride on the wild side — on a heli above San Francisco! Click here on Flickr album for a bird’s eye view of San Francisco. 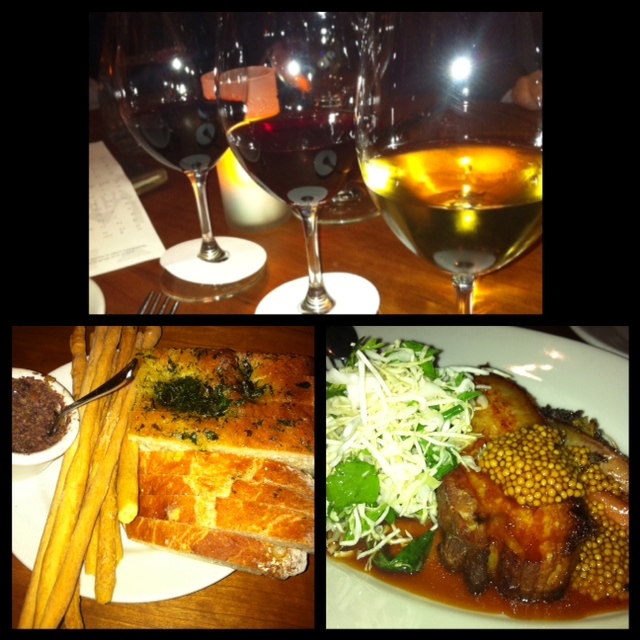 Another night, another phenomenal meal! 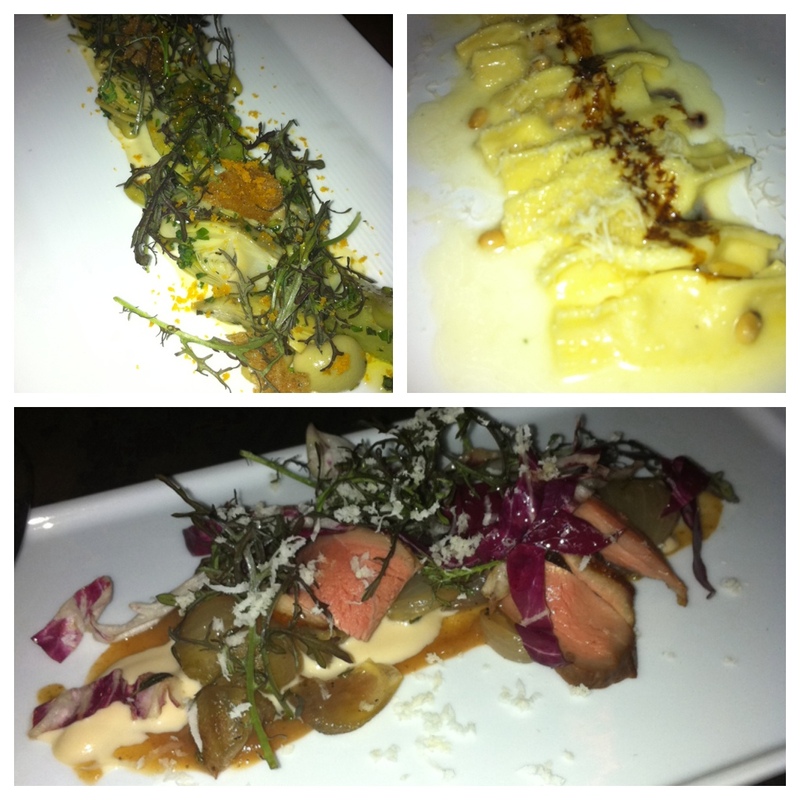 flour + water hit it out of the park again last Friday when I was in for dinner. Chef Thomas McNaughton was in NYC that night, so clearly he can rest at ease while away traveling! The kitchen was churning out food with a perfect finesse. We started the meal with a duck salad and then moved on to the marinated artichoke & shelling beans with tonnato sauce & bottarga. Following those two antipasti delights, we moved on to a cold calamari and melon salad with cucumbers, breakfast radish & olive sea salt. All of these dishes were light, bright and refreshing, and added the perfect balance of vegetables for the carbo-loading which ensued shortly thereafter. Then came the corn & prosciutto tortelloni with chives, a delicious stracciatella scarpiocc with pine nuts and drizzled with balsamic and a cocoa tajarin with butter braised giblets, butternut squash & sage. All pastas were amazing, but ESPECIALLY the last one — it was so buttery and so rich, yet not over powering and I didn’t even think about the giblets that I was shoveling in my mouth. 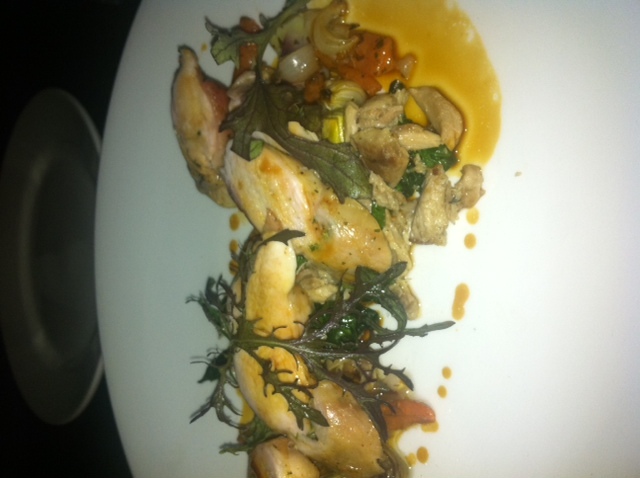 Lastly, the rabbit secondi was crazy out of this world. Chanterelles were stuffed under the little rabbit skin and the meat itself was so moist. 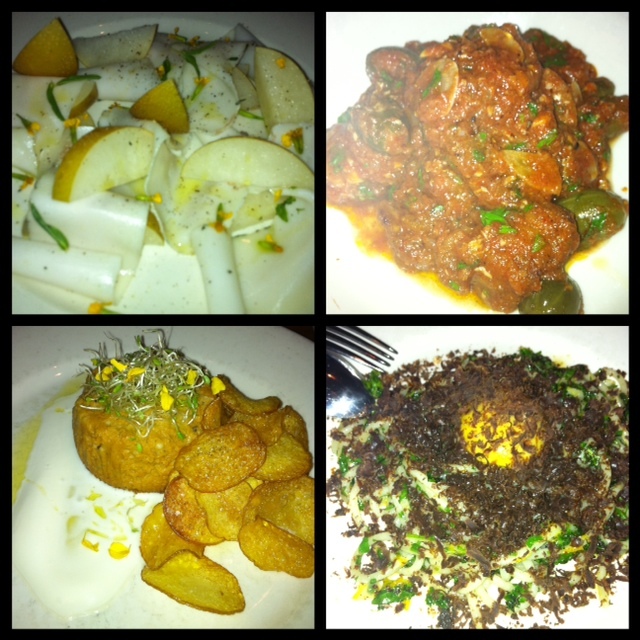 Accompanying the meat was an array of vegetables, including turnips and little, lightly fried green olives. As far as I’m concerned, this dish was a keeper! 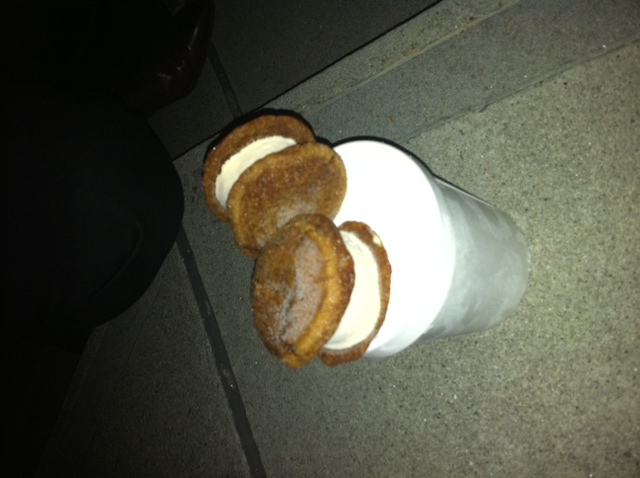 Following dinner were two short cocktail stops at Jasper’s Corner Tap & Kitchen and Redwood Room, then foie gras ice cream sandwiches from Humphry Slocombe enjoyed on the steps of the Grace Cathedral. Can you say, divine?! Kettle Whistle with Tell Tale Preserve Co.
Last weekend at @tomatotart‘s Intense Dark Party, I tasted a sweet, creamy Coffee Confiture from Tell Tale Preserve Company and it reminded me of what a talented guy that William Werner is! Though this venture ended due to differences with investors, it’s no doubt that what will emerge at Outfit Generic (as indicated on TTPCo’s Facebook) will be better than ever. After I carefully spread the Coffee Confiture on a slice of soft bread and bit into this perfect blend, I was taken aback to the Kettle Whistle afternoon tea party I attended at Burritt Room back in June. I never knew that art could be embodied in pastries, sandwiches and desserts, and served with Naivetea‘s imported Taiwanese oolong teas — well, let’s just say this was a perfect pairing. At 3:30 we were all let into the private room in Burritt Room and seated with our respected party. Vases with a few single lavender sprigs adorned the table and eventually course followed course (three in total), until the afternoon tea came to an end. Other nice touches included an amuse-bouche of cucumber, mint and marcona almond and a coconut-lemon-basil sorbet to complete the experience. Everything was beautifully plated and so creative. As a parting gift, we were each given a woven satchel to take home filled with Wen Shan Bao Zhong tea and “Damn Good” granola. Perfect for the day after! Sadly the final Kettle Whistle afternoon tea with Tell Tale Preserve Co. and Naivetea was back in August, but I have no doubt that Werner will be back soon with an even more fun, whimsical concept in no time! Here’s to knowing we’ll see those Rebel Within’s back at the market STAT! Click here to check out my Flickr album with all photos. Heyooo folks. I might be one day late, but can you blame me?! 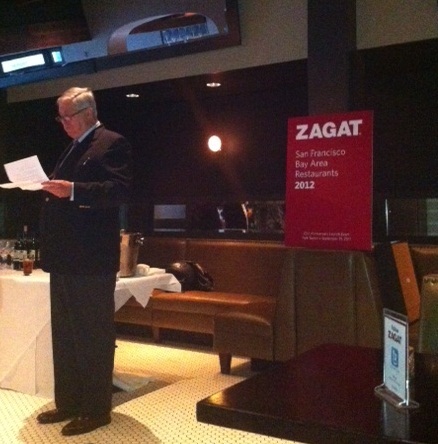 Monday was extra special with the 2012 Zagat San Francisco Restaurant Guide Launch at Park Tavern with Google! Let’s briefly review my twenty-something meanderings from a weekend out and about in San Francisco! Don’t: Rickhouse. I love Rickhouse, but it’s absolutely impossible to grab a seat, let alone a drink in the bar after work on a Friday. It’s packed! Their cocktails are top-notch, so I’d recommend going on off-peak hours. Do: Otis Lounge. 2 for 1 drink specials from 5pm to 8pm. Need I say more? Take a seat downstairs at one of the lounge tables, check out the scene and admire the peacock accents at this hidden spot on Maiden Lane. Bruce Hill’s Zero Zero in SoMa: OBSESSED! Start your meal with a punch bowl. 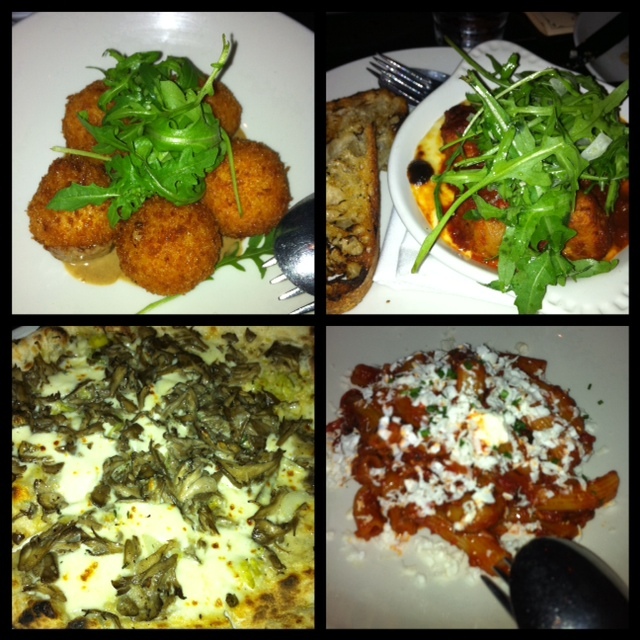 All of the food was amazing: Pork and Veal Meatballs with Spicy Tomato Sauce and Fonduta, Fontina Stuffed Arancini [balls] with Black Garlic Aioli, Ricotta Doughnut [balls] (are we noticing a theme here? tehehehe), Rigatoni with Piquillo Peppers, Pancetta and Ricotta Salata, and Fillmore Pizza with Hen of the Woods Mushrooms, Leeks, Mozzarella, Parmesan, Pecorino and Fontina. BTW I saw this pizza on 7×7’s Top 50 Vegetarian/Vegas Dishes To Try Before You Die. Oh yeah, and did I mention they have soft-serve ice cream? Get the vanilla topped with De Vero Olive Oil and Sea Salt. San Francisco Public Library: awesome way to save money on those books! I don’t know about you, but I don’t like keep my fiction books after I am done so as long as you can finish them during your rental period (or at least remember to renew). Figs topped with bacon and goat brie cheese are simply divine, as I experienced at Sabrina of @thetomatotart‘s Intense Dark Party. 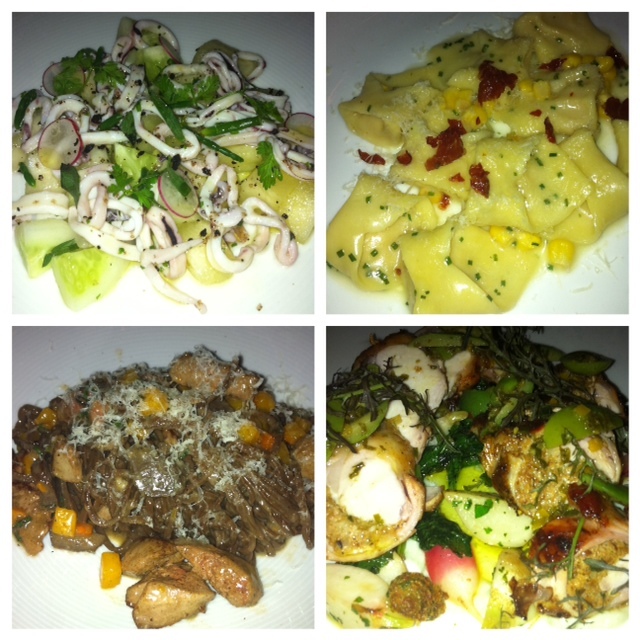 Chris Cosentino’s Incanto in Noe Valley: Eating for the first time at Incanto, I knew I was in for something special. And that something special began in the form of Ibérico di bellota lardo and Asian pears. I almost didn’t feel bad that I was eating pure, unadulterated fat. 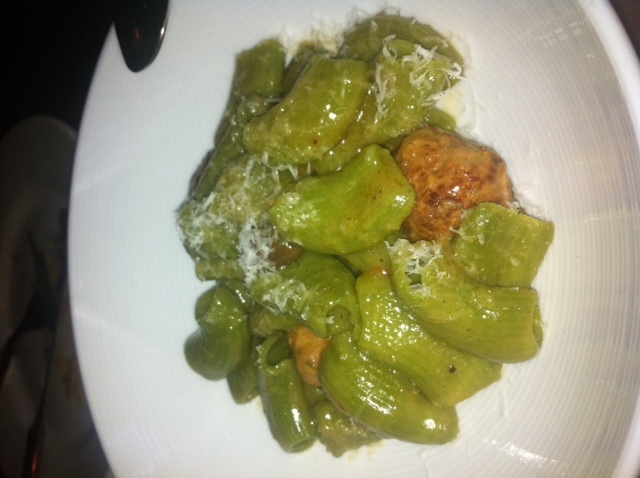 Then followed was a crazy special: Truffled Uni Sformato and Sweetbreads alla Puttanesca. 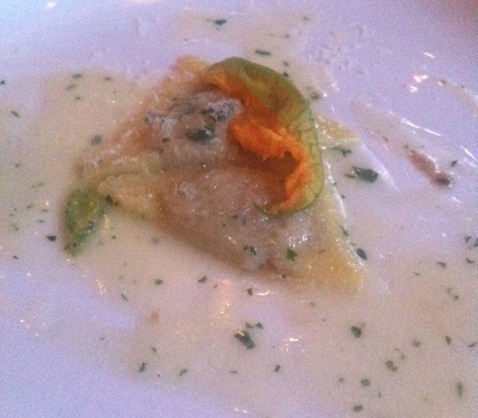 My tastebuds could not believe what they were experiencing! 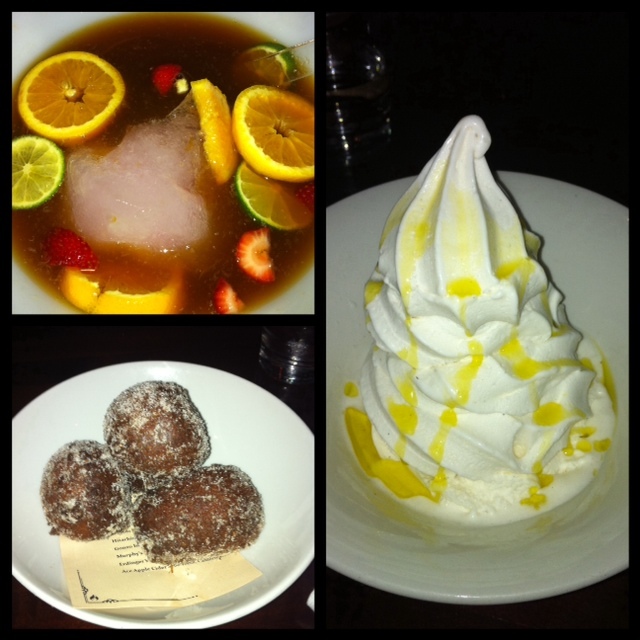 So much decadence, and only in the first three dishes. Then we moved on to the Spaghettini with Sardinian cured tuna heart, egg yolk and parsley. 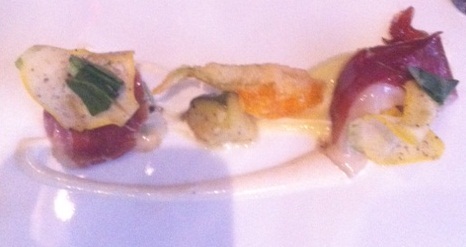 Simply amazing: the saltiness of the cured heart and the yolk added another layer of complexity to the dish. After that was the Pork Belly with cabbage, apples, rose geranium and pickled mustard seeds. Is it healthy to eat this much fat? Probably not. Does it bother me? Not in the least. From top left: Mystery Flight! Guess your wines! 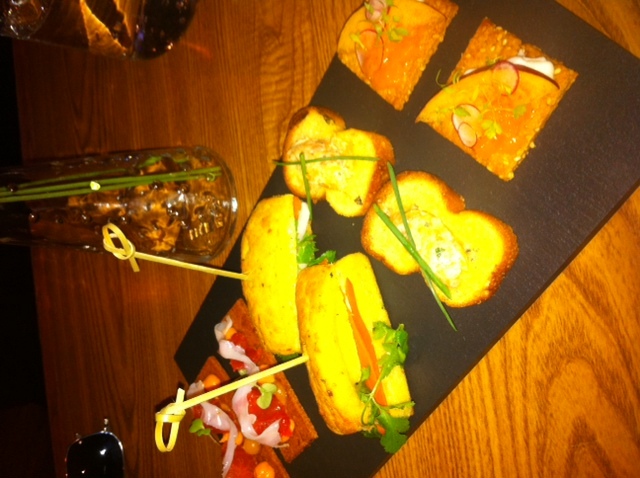 Pork belly and delicious bread plate. I know it's just bread. Don't judge! North Beach: There are so many fun shops in NB to hit up! Lola, Alla Prima Fine Lingerie and Craig Fonarow Photography were just a few that I admired while strolling Grant and Columbus Streets. After you’ve had your fill of browsing and window shopping, take some gelato into Washington Square Park and enjoy watching the dogs and families! La Mar on the Embarcadero: Always a winner; Cebiche Clásico and the Grilled Chicken Skewer with fried potatoes and Peruvian corn. Tip: spoon the juice or “leche de tigre” from the cebiche onto the rice. You’ll be glad you did. Bad pic I know, but the man himself. I finally had the opportunity to try some light bites from Park Tavern and they were delicious! 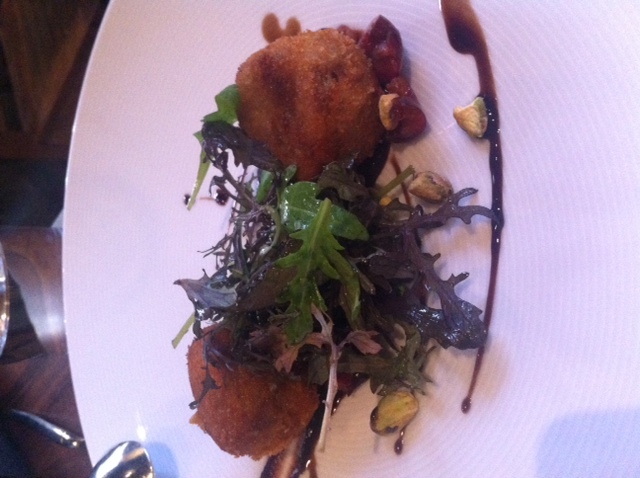 Especially loved the Fried Oyster “Caesar” Salad, Fried Green Tomatoes and Fried Pork Belly bites. Also, the Deviled Eggs with bacon was a tasty bite. I can’t wait to check it out for dinner! I hope you all had a fab weekend as well! Xo. Of course my Labor Day Saturday began with a trip to the Ferry Building Farmer’s Market. The first stop for breakfast: 4505 Meats. 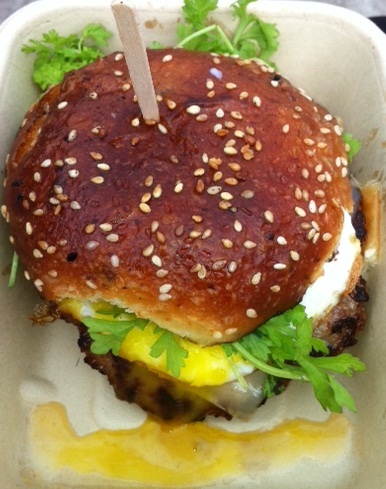 I went for the rather modest Bacon Maple Breakfast Sandwich with maple sausage, gruyere cheese, cress and nasturtium greens, and a runny fried egg. There’s just something about that buttery, seedy bun that makes me all warm inside. 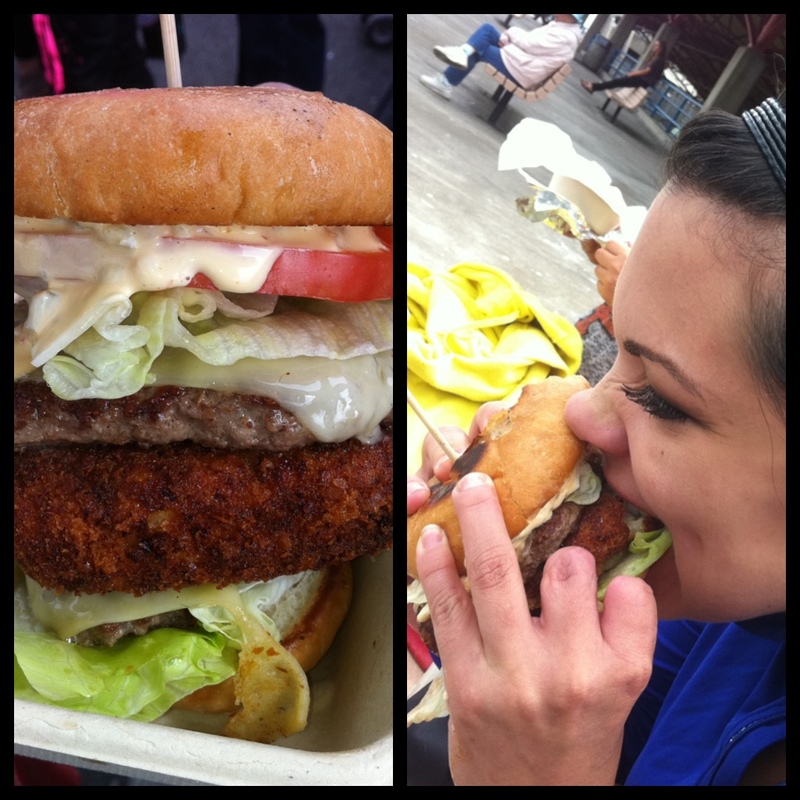 I just had to get a pic of myself trying to take a bite of @thedapperdiner’s massive double double 4505 Burger with Frankaroni, a patty of fried mac ‘n cheese and 4505 house-made uncured hot dog. One thing I love about the Ferry Building Farmer’s Market is the samples – I tried an Asian Pear from Frog Hollow Farm that was just so sweet and divine, Mt. Tam cheese from Cowgirl Creamery and some baba ganoush from Marin Gourmet. 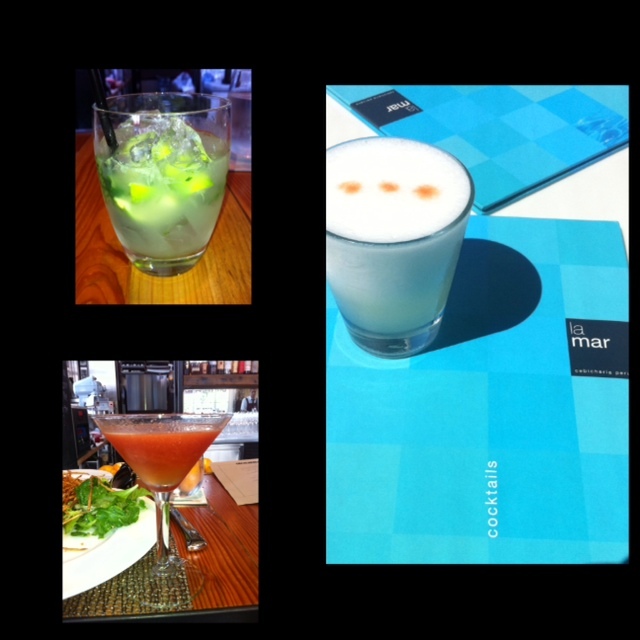 After Chicken and Beef Korean Tacos (2 for $6) from Namu, it was off to La Mar for a Pisco Sour and Lafitte for the 1st of 30 days of Caipirinhas. 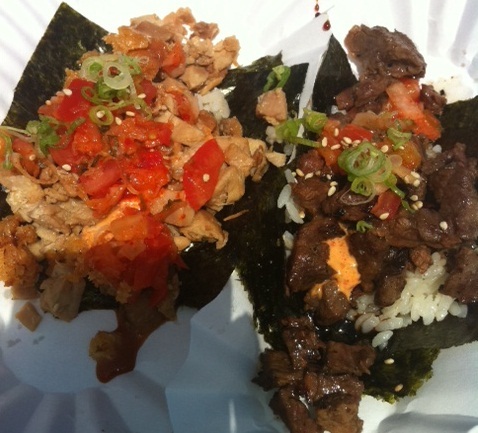 Korean Tacos with seasoned rice, daikon & kimchee salsa, kimchee remoulade, housemade teriyaki sauce on seaweed. Yes, I did eat the spilled over filling with my fingers. It was that good! @thedapperdiner and @carinaost got the Scallop and Pork Hot Dog with spicy pickles, stone fruit mustarda and skinny pomme frites, of which I had to steal a taste. My second drink at Lafitte was the Heirloom, made with Swans Neck Vodka, Averna, Prado Pastis, tomato and herbs. This drink seriously tasted like an heirloom tomato salad – it even had a nice salty bite to it. 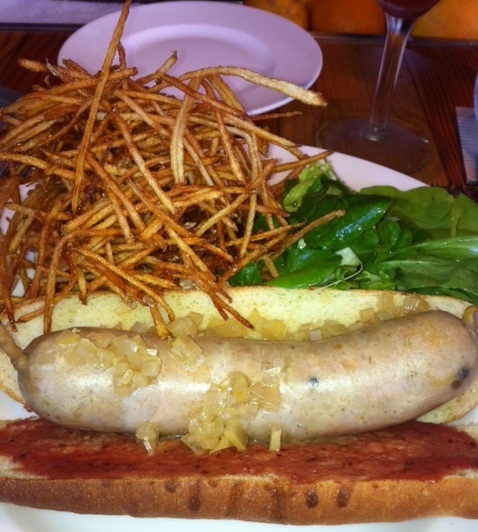 Leave it to the Dissident Chef to come up with a Scallop and Pork hot dog! How could I top this morning/afternoon? 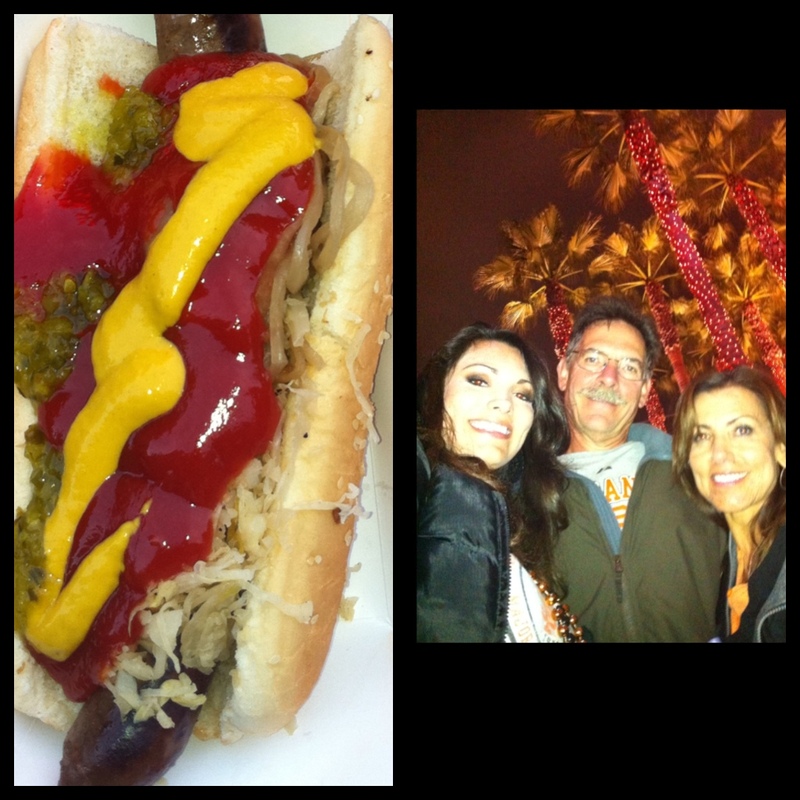 A Giants game with the parents. Sadly the Giants lost this one to the D-backs, but I was able to get in on the Sheboygan Bratwurst Stand and some garlic fries, natch. At the games, you must skip the plain ‘ole hot dogs and go straight for the big honkin’ Sheboygan topped with grilled onions and sauerkraut! You’ll be glad you did. Oh and make sure you have extra powerful gum/mints for those garlic fries. My giiiiiant Sheboygan and the parentals in front of the park! 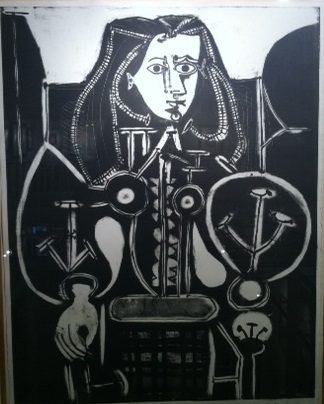 Since the Steins Collect: Matisse, Picasso and the Parisian Avant-Garde exhibit at the San Francisco Museum of Modern Art is ending on September 6th, a girlfriend and I tried to hit up the museum on Sunday – but beware: apparently the tickets for these kinds of exhibits sell out! After attempting to get our culture on in the MoMA store, we decided to stroll up Geary and stop in the free galleries that decorate the street. I highly recommend this as a cheap alternative, since all of the galleries are free AND open on Sunday! After paying a visit to Cohen Rese Gallery and the Martin Lawerence Gallery (who is holding an upcoming art auction at Stanford Court BTW), we stumbled into Christopher-Clark Fine Arts. And lucky that we did! 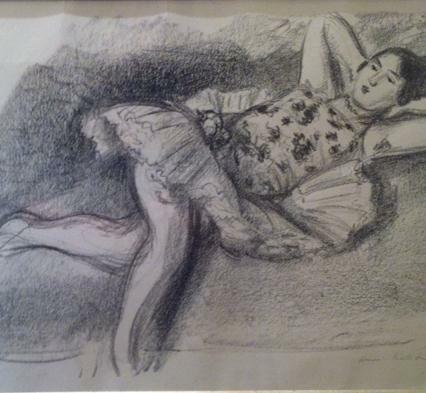 Insider tip: they had work from Matisse, Picasso, Varya and more – and some of the pieces were actually featured in the Steins Collect exhibit. Later on, I was finally able to check out Chambers Food + Drink (in the former Bambuddha Lounge space at the Phoenix Hotel). I highly recommend the Truffle & Wild Mushroom Dip with waffle chips, Panchetta Wrapped Figs with Balsamic Reduction, the Sizzling Kobe Tri-tip (it’s served on a hot stone, medium rare – so cool) and the Sea Bass with big, lovely artichokes. I had high hopes for the PB & L.T., which was basically pork belly atop rice paper filled with heirloom tomatoes and lettuce, and the Burrata Gnocci, but I would skip those. Of course dinner was followed by some dancing at 222 Hyde and some pool-playing action and jukeboxin’ at CC’s Cocktails! Both good haunts for the aforementioned activities! Sometimes you just need a lazy day and even though Monday was absolutely AMAZING weather-wise, I was just plain old lazy! Kudos to all of you who BBQ-ed and did other fun things outdoors. I did rally myself to meet @thedapperdiner and @carinaost at Tataki South in Noe Valley, a restaurant known for its sustainable sushi. They had some *daring* (re: spicy) sushi rolls, including the Extinguisher with albacore, habanero masago and spicy aioli, and the Russian Roulette with crawfish, cucumber, asparagus, tobiko and topped with scallops. The premise of this roll is that one of the pieces is over-the-top spicy and whoever is the winner (or loser), gets the prize of a shot of nigori sake to cool the burn. Not a game for the weak of stomachs. 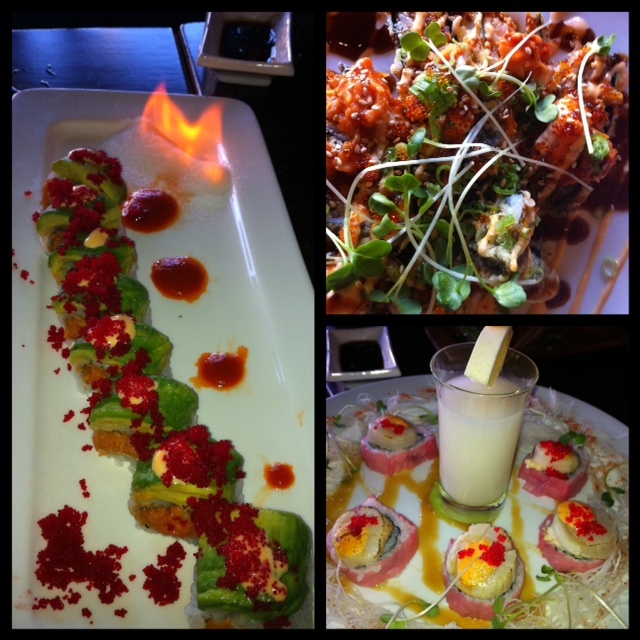 Tataki South also had a great happy hour from 5pm-7pm: $4 rolls and $3.5 hot sake, yes please! Can I get a “holla” for the staycation?! I hope y’all had a fun-filled, restful Labor Day weekend as well and happy Tuesday! flour + water is by far one of San Francisco’s top Italian restaurants. Nestled on the corner of Harrison and 20th Streets in the Mission, F+W is doling out the goods — and it is a well known fact, as we all have heard the notorious story that Apple CEO Steve Jobs himself was denied a table one fateful night. The Summer Pasta Menu couldn’t be more representative of this time of year — when it actually feels like summer! So hurry up and get your bootay in there to try Chef Thomas McNaughton’s hand made, perfectly al dente pasta. This stuff is seriously outta this world and we would expect nothing less from Chef, having held sous positions at both Gary Danko and Quince. I didn’t get a chance to try any of the Neopolitan style pizzas straight outta the Italian wood-fired oven but I’ve heard great things, so if you have an opportunity to try some of these pies, do! 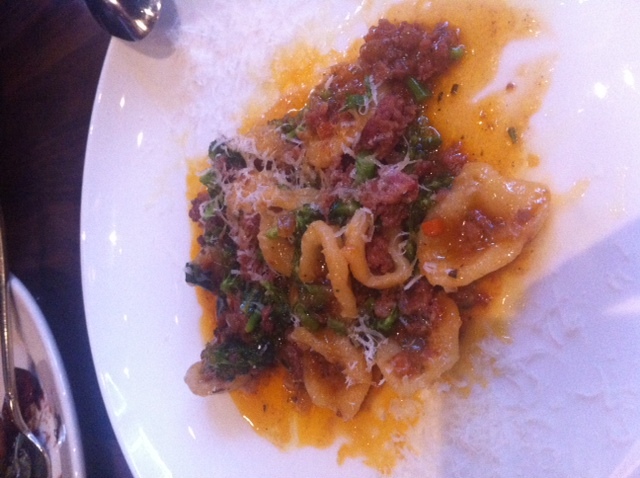 orecchiette with goat sugo, broccoli di ciccio & rosemary. talk about goat-y goodness! The restaurants keep half of the tables open for reservations and half open for walk-ins, so either get there early or consult OpenTable. It’s also fun to stand in the bar/door area with a glass of wine in hand, giving each table the evil eye and betting with your dining companion on which will be the first to pay the bill and vacate the premises. Another cool addition is the Dough Room, which by day moonlights as a prep kitchen and by night morphs into a great pace for parties of 8 to 10 with either an 8 course tasting menu option or a family style menu option. They first Monday of every month are Guest DJ Nights (heeeyyy-o) so if you feel like listenin’ to some smooth beats while indulging, stop in on Semptember 5th when Thao Nguyen of Thao and the Get Down Stay Down makes an appearance. Your taste buds will be happy and your eardrums buzzin’ — heck, you might even get up and get your groove on! Warning: Flour + Water may cause massive amount of delicious food consumption and you most likely will need a digestif after dinner (Fernet anyone?! 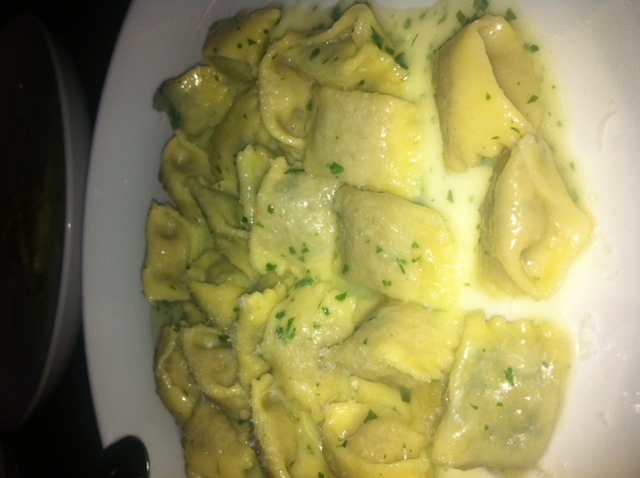 ), but the carbo loading is definitely worth an extra cardio sesh in the morning. flour + water. 2401 Harrison Street. 415.826.7000.